28.08.2015. Birds Nest Stadium, Beijing, China. 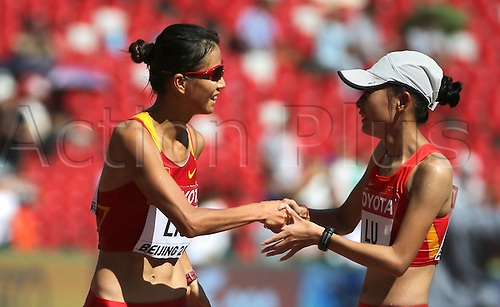 Second Placed Chinese Xiuzhi Lu (R) and Hong Liu celebrate after the 20 Kilometers Race Walk at the 15th International Association of Athletics Federations (IAAF) Athletics World Championships in Beijing, China, 28 August 2015.